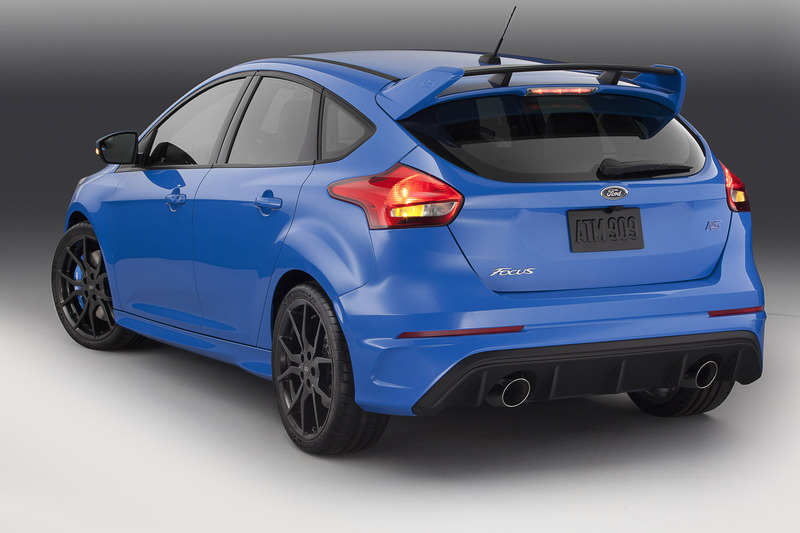 Ford Focus RS is set to debut on U.S. soil at the 2015 New York International Auto Show. Focus RS pioneers innovative Ford Performance All-Wheel Drive delivering blistering cornering speed for thrilling performance and unbridled driving enjoyment for enthusiasts in North America for the first time. 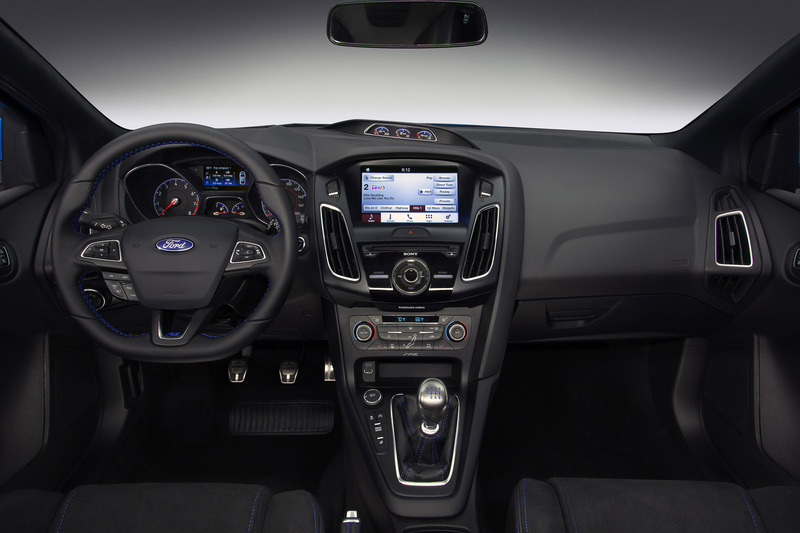 The high-performance road car introduces advanced performance technologies, and is the first Ford RS equipped with selectable drive modes – including industry-first drift mode as well as launch control. 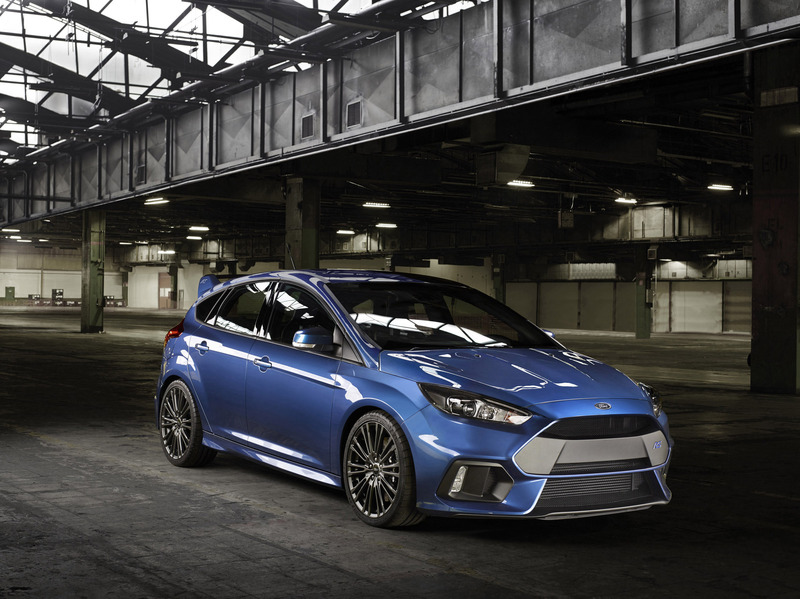 The third-generation high-performance hatch features a 2.3-liter EcoBoost® engine delivering well in excess of 315 horsepower, along with the most powerful Ford RS braking system ever. 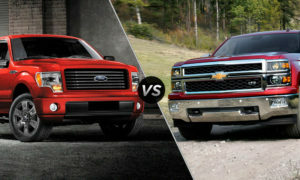 Its dramatic exterior design offers optimized aerodynamics and cooling, with 9 percent less drag over the previous model. 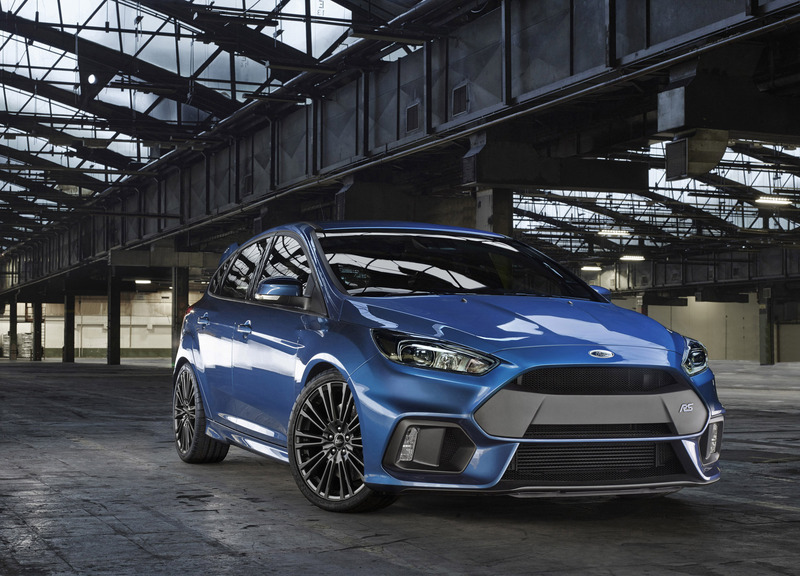 “Customers have begged for the Focus RS to come to the United States for years,” said Raj Nair, group vice president, Global Product Development, Ford Motor Company. 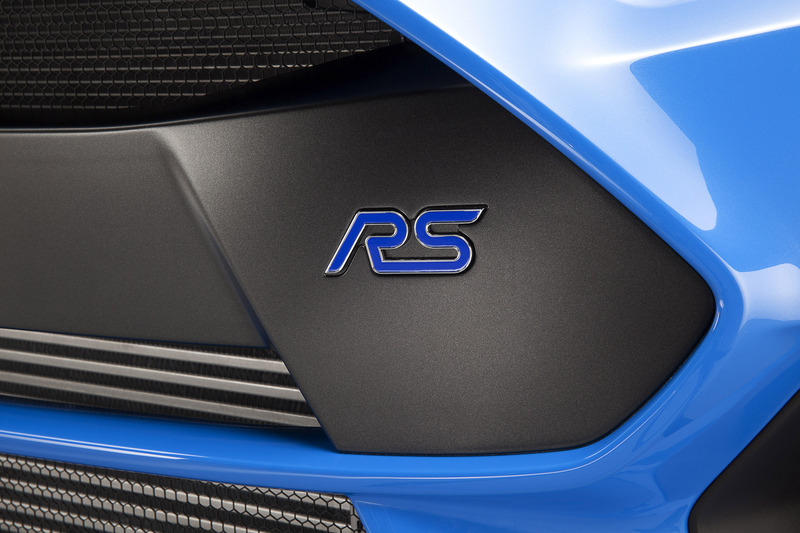 “And now we can say that they are getting one of the most innovative, powerful and best-looking RS cars ever. That is special. 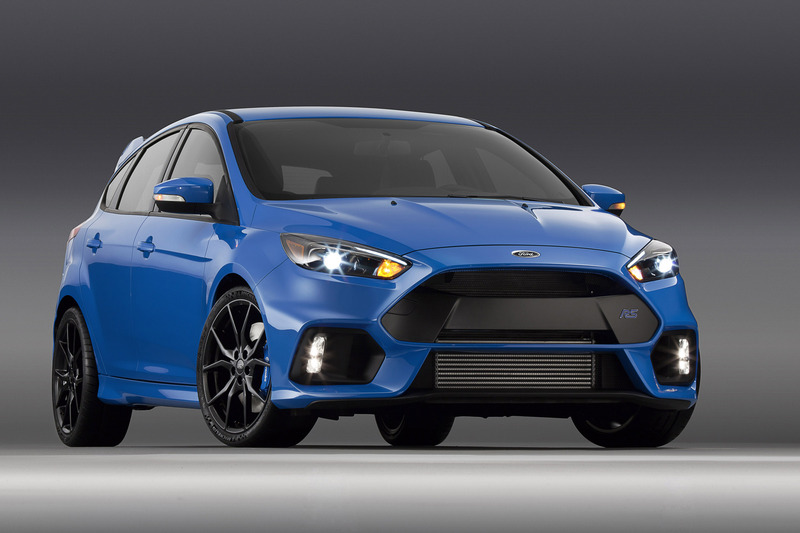 The all-new Focus RS is the first model that will be produced for all markets at Ford’s Saarlouis, Germany, manufacturing plant beginning late this year, with sales in North America beginning in spring 2016. Focus RS leverages innovative Ford Performance All-Wheel Drive with Dynamic Torque Vectoring to deliver a new level of handling capability and driver enjoyment – combining outstanding traction with unmatched agility and cornering speed. The system is based on electronically controlled twin clutch packs on each side of the rear-drive unit. The control unit continuously varies front-to-rear and side-to-side torque distribution to suit the driving situation – monitoring inputs from multiple vehicle sensors 100 times per second. A maximum of 70 percent of the drive torque can be diverted to the rear axle. Up to 100 percent of available torque can be sent to each rear wheel delivering the torque-vectoring capability that has a dramatic impact on handling and cornering stability. In cornering situations, the rear-drive unit pre-emptively diverts torque to the outer rear wheel based on steering wheel angle, lateral acceleration, yaw and speed. This torque transfer has the effect of “driving” the car into a bend – achieving improved turn-in and stability while virtually eliminating understeer. The system is tuned to deliver exceptional grip – with lateral acceleration exceeding 1 g – along with exciting cornering speed and acceleration out of a bend. With neutral and adjustable at-limit handling and the ability to achieve controlled oversteer drifts at the track, Focus RS delivers the ultimate fun-to-drive experience. To deliver optimum driving dynamics, Ford Performance All-Wheel Drive is calibrated alongside the car’s advanced Electronic Stability Control, in particular, the brake-based torque-vectoring system that works in parallel with torque-vectoring all-wheel drive. Other exclusive chassis features include a sport suspension with stiffer spring rates and more efficient bushes and antiroll bars than those found in Focus ST, and two-mode switchable dampers, which offer a firmer setting for track use. Specially tuned electric power-assisted steering, in combination with an optimized front suspension knuckle design and shorter link arms delivers connected and responsive steering with outstanding feel. 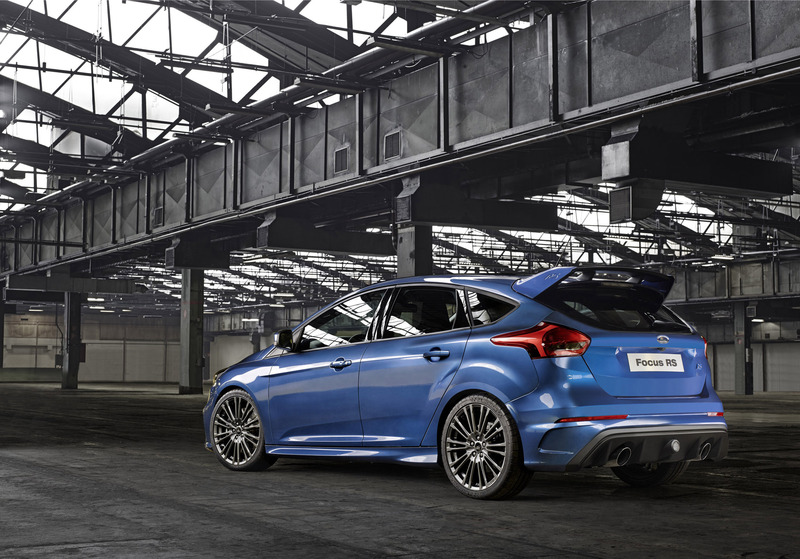 Ford worked with Michelin to develop a choice of high-performance 235/35R-19 tires to complement the driving dynamics Focus RS offers – a standard Pilot Super Sport for everyday use and, for the first time, an optional Pilot Sport Cup 2 for enhanced dynamics at the track. The car’s exterior design supports the dynamic objectives as well. Aerodynamic optimization of the front splitter, rear spoiler and underbody eliminates lift forces, resulting in balanced performance with zero-lift front and rear for optimum high-speed handling and stability. With a drag coefficient of 0.35, the shape of the new Focus RS is 6 percent more aerodynamic than the previous model, and with its more compact frontal area, the car generates 9 percent less drag – improving high-speed performance and reducing fuel consumption. 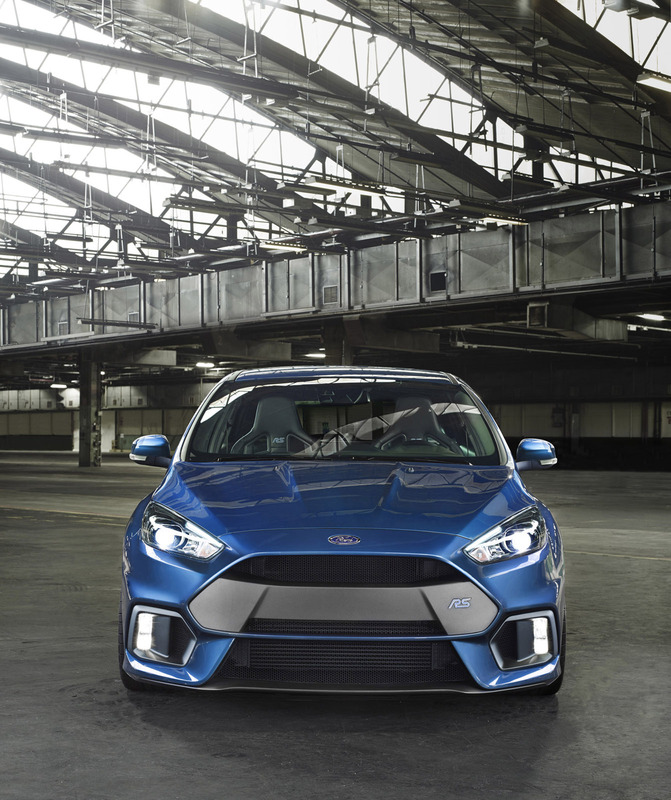 The all-new Focus RS offers advanced performance and driver-assist technologies to help ensure its extreme driving capabilities are accessible and easy to use. The driver can select from four different drive modes to configure the car for optimum performance in road or circuit driving conditions – normal, sport, track and a special drift mode. Using a switch alongside the gear lever, the driver can choose settings for all-wheel drive, damper control, Electronic Stability Control, steering and engine response, as well as exhaust sound. Industry-first drift mode is specially calibrated for all-wheel drive to modify torque distribution to help the driver achieve controlled oversteer drifts at the track. Launch control configures the car’s chassis and powertrain systems to deliver the fastest possible acceleration. The driver selects launch control from the cluster menu, engages first gear, applies full throttle and releases the clutch. The car then delivers optimum drive – distributing torque through the all-wheel-drive system, maintaining maximum torque using the turbo overboost function, managing traction control and setting the dampers. To achieve maximum acceleration through the gears, a performance shift light in the instrument cluster alerts the driver when the optimum upshift point of 5,900 rpm approaches, flashing if the engine hits the 6,800 rpm limit. For enhanced braking performance in hard driving at the track, Focus RS features 13.78-inch ventilated front discs – up from 13.23 inches on the previous model. Lightweight aluminum four-piston monobloc Brembo calipers are painted distinctive RS blue with a Brembo logo available. To help minimize fade under sustained track use, brake cooling is maximized through dedicated cooling ducts fed from the front fascia, twin “jet tunnels” in the underbody and airflow guides on the lower suspension arms. The front discs feature aerodynamically optimized ventilation fins for enhanced cooling. Projected to deliver well in excess of 315 horsepower, the Focus RS 2.3-liter EcoBoost shares its fundamental structure with the all-aluminum four-cylinder engine in the all-new Mustang. What’s different is that the RS engine features a comprehensive package of design changes. Increased output is generated by a new low-inertia twin-scroll turbocharger with larger compressor that delivers significantly greater airflow, along with a much bigger intercooler to maximize charge density. Engine breathing is enhanced through a less restrictive intake design, and a large-bore high-performance exhaust system with electronically controlled valve in the tailpipe helps optimize the balance of back pressure and noise output. Engine cooling has been given the highest priority. Engineers created additional space within the front of the car to house a significantly larger radiator pack – the biggest ever fitted to a Focus – that provides the level of cooling demanded for hard driving. The cylinder head is produced from an upgraded alloy material capable of withstanding higher temperatures, and is mounted on a more robust head gasket with improved thermal capability. Stronger high-tensile cast-iron liners are used for the cylinder block. With its high-efficiency design featuring direct fuel injection, twin independent variable camshaft timing, advanced turbocharging and Auto Start-Stop, this EcoBoost engine delivers exceptional power and respectable fuel consumption. The six-speed manual is optimized for the enthusiast driver with a shorter gear shift and revised mechanism to deliver faster, more accurate shifts. Both transmission and clutch are upgraded with stronger components to cope with the engine’s increased torque output. Ford Performance engineers have tuned the car to deliver a rewarding and sporty sound character in spirited driving, with signature Focus RS burbles and pops. “This very special 2.3-liter EcoBoost unit will inspire drivers as they feel the surge of the turbo, and reward them as they take it to redline – all delivered with a stirring sound guaranteed to put a smile on their face,” said Pericak. The exterior is dramatic and functional. 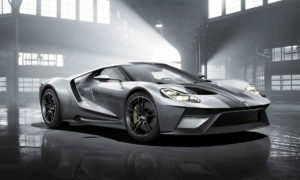 Designers worked closely with Ford Performance to ensure functional attributes were achieved, focusing on aerodynamic downforce and balance and the cooling demands of the powertrain and brakes. The result is a powerful, muscular character. 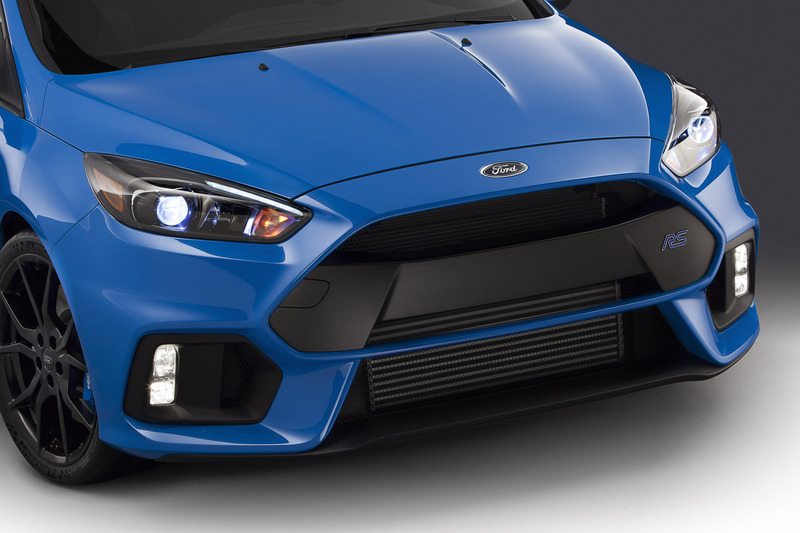 Focus RS, based on the standard model, features a powerful new front end look, with a bold upper trapezoidal grille above a deep splitter incorporating the largest possible openings for engine cooling. Bi-xenon HID headlamps offer brilliant illumination in all road conditions. The wide, muscular stance is emphasized by lower wings and large outboard openings on each side of the car, which feed the brake cooling ducts and house vertically mounted fog lamps. At the rear, the fascia panel is dominated by an exceptionally large diffuser that optimizes airflow from under the car. 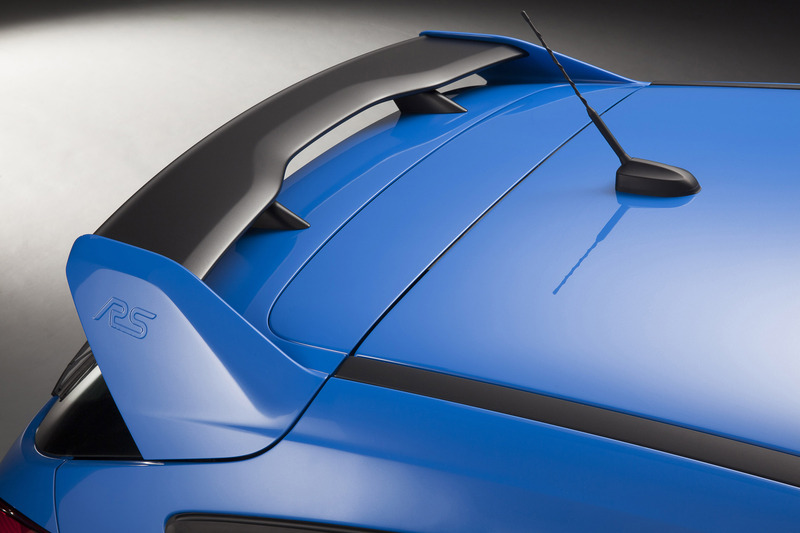 The distinctive roof spoiler is integrated with the car’s silhouette through body-colored side panels featuring a subtle embossed RS logo. 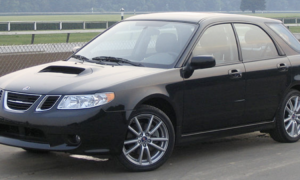 The dynamic side profile is emphasized by sculptured rocker panels and bold wheel lips that house a choice of multi-spoke 19-inch RS alloy wheels, including the high-performance, lightweight forged design finished in low-gloss black that offers enhanced strength and impact resistance with a weight savings of 1.3 pounds per wheel. The high-performance character is reflected in the cockpit, with heavily bolstered, partial-leather Recaro sport seats as the centerpiece. A soft-feel flat-bottomed steering wheel, leather-covered rim, alloy pedals and unique instrument graphics in the main cluster reinforce the performance character. 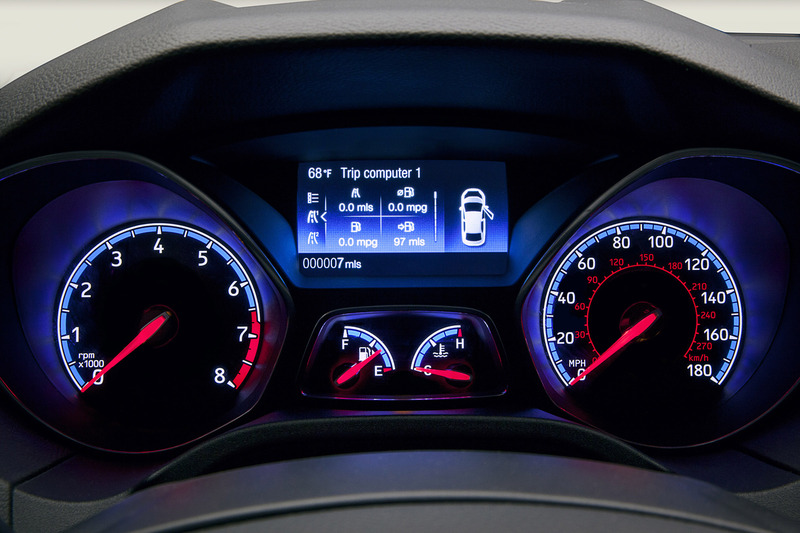 Gauges atop the center console display turbo boost pressure, oil temperature and oil pressure. The distinctive blue RS theme is echoed throughout the cabin in the stitching on the seats, steering wheel, floor mats, interior trim, colored graphic on the gear shift and in the RS logo itself on the seats, steering wheel and door scuff plates. 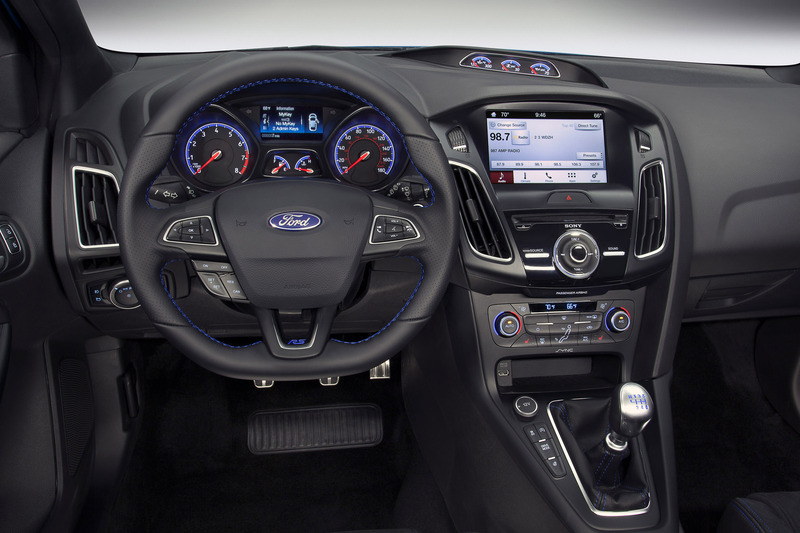 The interior features the redesigned Focus control layout, with 8-inch capacitive touch screen with SYNC® 3 voice connectivity for audio, navigation, climate control and mobile phones. 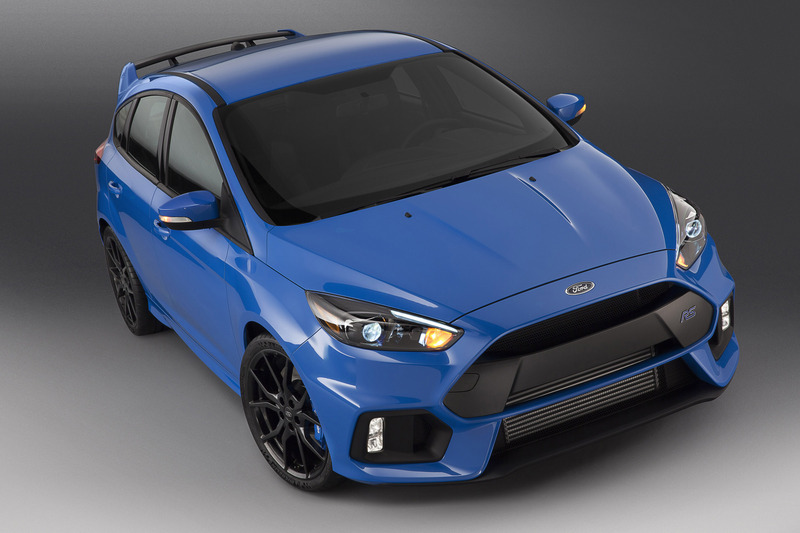 Four striking colors for the exterior include Focus RS-exclusive Nitrous Blue, a vibrant four-coat metallic finish, as well as Stealth Gray, Shadow Black and Frozen White. Since the first Ford RS models took to the road, the marque has been an essential element of Ford DNA – delivering technological innovation and performance for road and track. 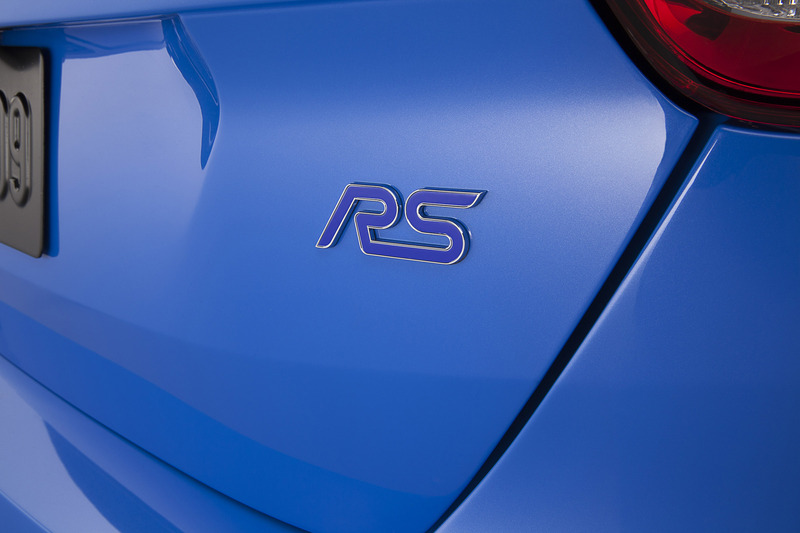 Dating back to the early days of the company’s success in Rallye Sport, the first models established the RS reputation for advanced technology and driving exhilaration. The original 215-horsepower Focus RS from 2002 featured a 2.0-liter turbocharged engine and advanced limited-slip differential. The second-generation model sent 305 horsepower through its front wheels with a groundbreaking RevoKnuckle suspension design. 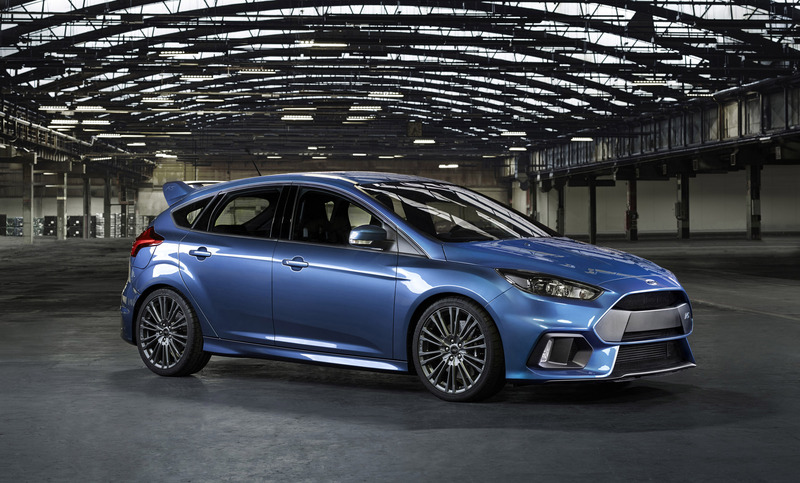 The all-new Focus RS is the latest vehicle to be unveiled as part of a new era of Ford performance that will bring to customers globally more than 12 performance vehicles through 2020. In addition to pleasing enthusiasts, RS vehicles help deliver the company’s One Ford plan for profitable growth, product excellence and innovation in every part of its business.